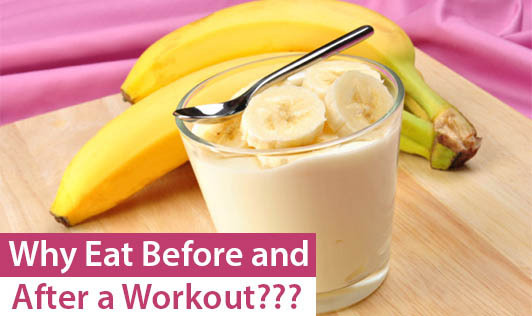 Why Eat Before and After a Workout??? Does your Health Expert always say that diet and exercise go hand-in-hand for you to achieve your health goal? Every word of it is true! Are you burning 500 Cal on your treadmill but still your weighing scale is not showing any great change? The reason behind it is, most of us carefully watch the three meals in the day while, we don't pay attention to the foods that we eat pre and post workout. There is this common misconception that eating before a work out will not help you to lose weight. The fact is, a pre-workout meal is as important as a post- workout meal. It is no doubt fat burning remains the same whether you have a meal before workout or not. But working out on an empty stomach will cause loss of muscle mass. When you starve and workout, your body reaches survival mode where it will draw proteins from the muscles instead of drawing it from the kidney or the liver. The loss of muscle mass brings down your body's metabolic rate thereby making it hard to lose weight. Also, working out on an empty stomach brings down your efficiency and so you cannot give your best during your training sessions. During exercise, your body uses up stored glycogen from the muscles to give you energy. Refilling your body with foods (solid/liquids) helps build and restore the muscles that were broken down, thereby keeping your metabolic rate high. The body's ability to restore muscle mass decreases by 50% if you refuel your body after two hours. So the sooner you refill the better for you. What to eat before and after work-out depends on your exercise regimen. Why not talk to your Dietician and get a diet plan tailor-made for you?